128 x 64 pixel single colour LCD graphic display (black with rearlighting through white LED), to the 6 buttons (with preset functions) membrane keyboard and to the CAN bus (for the connection to the controller); this last also allows the use of the interface in multimaster networks. 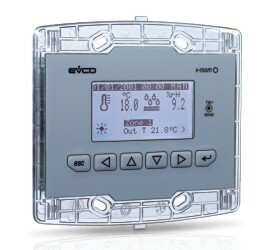 - by wall (built-in), in box like "506"
- by wall, through the support CPVW00 by Evco. Also the necessity to customize the interface, in order to integrate it aesthetically in residential and commercial environments, is satisfied by Vroom since at the front of the interface one can apply both the plates CPVP* by Evco (made in plastic material and available in two different colorations, white and black) and the numerous plates series "Living" and "Light" by BTicino.